I love avocados, don’t you? It seems there is always some new way of eating them, and whether you’re just scooping out that creamy, vibrant flesh onto a salad or whipping up some guacamole, it never fails to impress. And rightly so – avocados are some sort of super food, full of goodness and the perfect fat source for any healthy diet. Avocados are packed with vitamin E, which is great for your skin, and contain more potassium than bananas. Avocados are a great source of mono unsaturated fats, which have been proved to lower levels of cholesterol and prevent heart disease. People always wrongly assume ‘fat is bad’ but actually, fats such as those found in avocado are incredibly good for you. 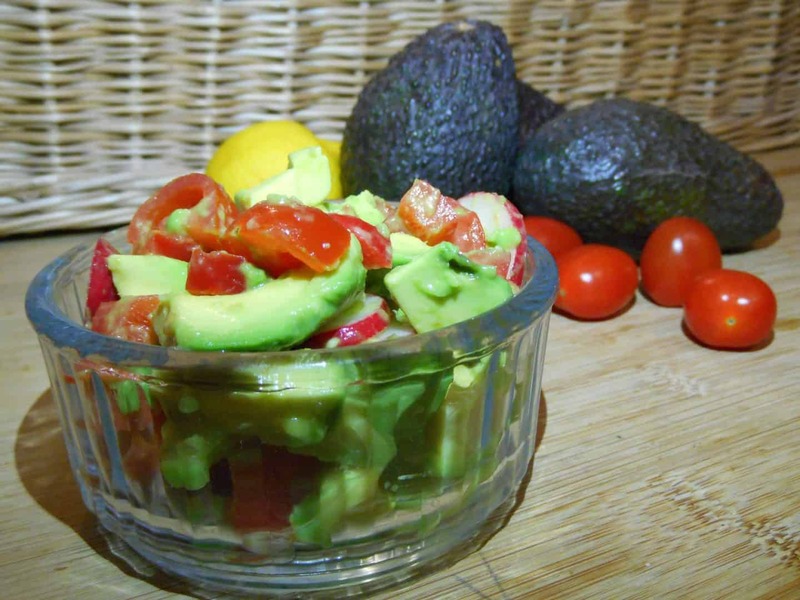 Avocados – so good for you! I wanted to make something a bit tangy and tasty to go with my salad, so I decided upon an avocado salsa. This recipe is literally so simple – chop everything up and mix it with a splash of lemon (to keep the avocado that beautiful green colour, rather than brown) and a dash of apple cider vinegar. Done. Apple cider vinegar is a hot trend right now – and it seems rightly so. It has a wide range of uses, from topical to digestive, and is one of those amazing ingredients which can soothe anything – from sunburn to indigestion. It’s supposed to be great for helping with stomach problems, so as a coeliac, taking apple cider vinegar may help to soothe any discomforts from ‘gluten attacks’. So if you’re stuck in an avocado fix, this recipe is guaranteed to perk up your salad. It’s gluten free, dairy free, egg free, wheat free, paleo, vegan – you name it, so perfect for anyone. Prepare the avocados by chopping in half. Remove the stone and score each half like a grid. Then use a spoon to scoop out the flesh into a bowl. Juice the lemon and add to the avocado – mix well. Finely slice the radish; chop the tomatoes into quarters; finely chop up the red pepper. Add all of these to the bowl. Pour in the apple cider vinegar and add the salt. Mix well and serve. Will keep in the fridge for a day or so. TIP: If you’re saving this for later, keep the avocado stone and add it to the bowl. This will help keep the avocado green. Enjoy! Next Post Gluten free carvery at The Pier House, Westward Ho!